Ruffles and stripes. Kinda like PB&J or bacon and eggs. Some things just go together. 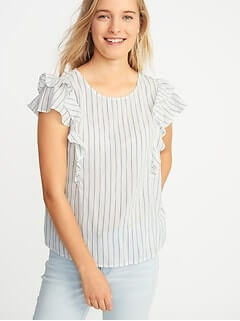 Short flutter sleeves, with ruffle trim along front seams. Lightweight, semi-sheer cotton blend, with all-over striped pattern.